First off, if you haven’t read the latest offering from The Wild Hunt on Mothers’ Day, you really ought to. It includes a concise history (which I was not aware of before) as well as possibly spiritual implications this secular holiday may have for Pagans. This is the first time I’m officially celebrating Mothers’ Day now that I’m expecting. Despite her not having been born, the little one growing in me makes me a mother; an inexperienced mother, but a mother all the same! Weretoad has arranged for me to get a maternity massage in the near future and brought me to see “The Great Gatsby” last night (which I thoroughly enjoyed). Today we went to Foxy’s restaurant in Fisher’s Landing on the St. Lawrence River to celebrate with my parents. The view there is spectacular and they gave mothers a free dessert. Nom! I wanted to include a special ritual on my first personal observation of Mothers’ Day. In particular, I wanted to give offerings to my spiritual mothers. I’d never thought of doing that before, but becoming a mother really makes one reflect on the sacrifice it takes to be one, and thus I reflected on how I should have been doing that all along! Originally, my intent was to share a cup of pregnancy tea with my Ancestral Mothers. The more I thought, I realized that I should also honor the Earth Mother, the Mother Nature Spirits, and the Mother Goddesses, especially my lady Brighid. They all play an important role in my concept of what it is to be a mother – whether biological or not. 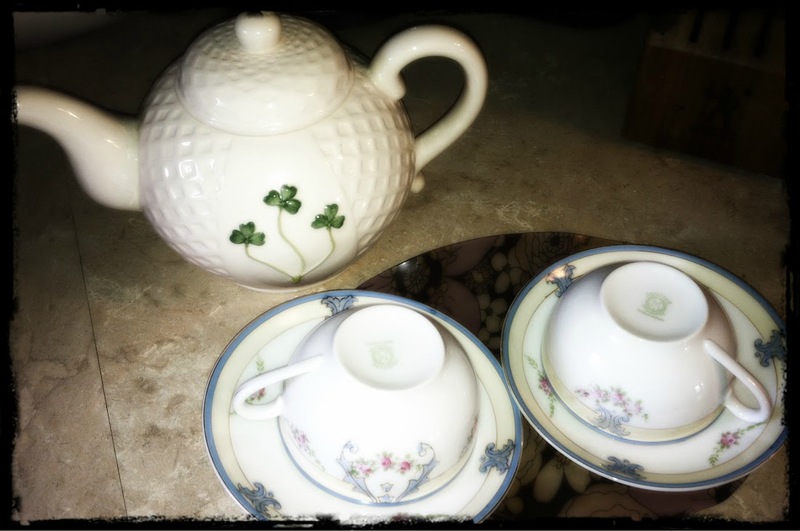 And so, I organized a bit of a tea party devotional! My very eclectic tea set ready for the job! Photo by Grey Catsidhe, 2013. I made a pot of pregnancy tea and brought two teacups and saucers to my altar – one to act as an offering bowl and the other for my portion of the tea during the return flow. I spoke words of praise and thanks to the Earth Mother and Mothers within the Three Kindreds. I poured tea and meditated. I drew omens to see what blessings or lessons they had for me on my new journey and they were very good and encouraging. The Nature Spirits gave me the raven for initiation and protection. The Ancestors sent me the dog for companionship and protection. The Goddesses sent me the boar which signifies the strength of a warrior. I directed those blessings into my cup of tea and drank them up. I also directed them into an amulet I intend to have with me at the birth. My tea party devotional was a wonderful way to connect with the maternal energies on this day. I feel the rite was successful and I intend to do another next year.